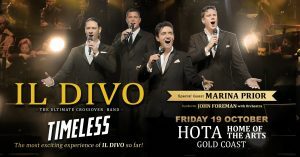 We’re thrilled to announce Il Divo and Marina Prior will perform on Friday, the 19th of October at H.O.T.A. Home Of The Arts, Gold Coast! The original and still the world’s best classical cross over group, Il Divo, are heading our way in October for a national tour. Australia is one of the most successful territories for the multi-national vocal quartet, who have become one of the best-selling music groups in the world. Il Divo came together following an international search that discovered the fabulous four. They have released seven studio albums to date, most recently in 2015. They are set to release another album in August in Australia, through Universal Music, with a brand-new single going to radio in mid-May. They will be supported by one of Australia’s favourite stars, Marina Prior, whom has become known as our leading lady of musical theatre. Marina has played over thirty lead roles in such shows as Les Misérables, Camelot (opposite Richard Harris), The Phantom of The Opera, West Side Story, Guys & Dolls and Hello Dolly. These shows are not to be missed – be sure to get your tickets quickly.